J. flew home from a work trip to New York this morning, right on time for freshly made rice porridge and plum tarts, and to watch The Snowman on the telly. This year we're having a quiet Christmas at home, with nothing but eating all sorts of delicious things, resting and watching lots and lots of Christmas movies planned the whole time. I hope you all have a really wonderful holiday time, that you have nice weather, good food and dear friends near, and that your days are filled with joy and magic. A huge, great big thank you to everyone who took part in Giveaway Day, and especially to the whopping 160 of you who participated in my little giveaway. 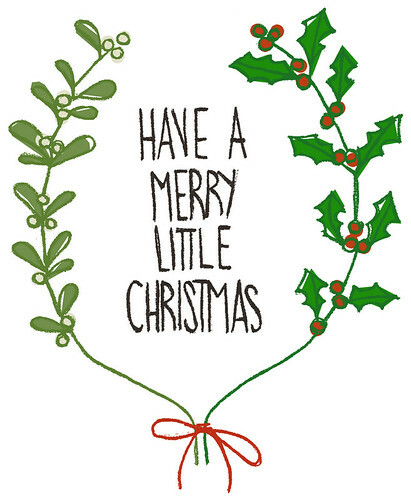 May all of your dearest wishes come true, and may all of you have a lovely, merrily jolly holiday season! We still don't have any snow here, and actually we lost what little snow we'd had fall to a dreary, drab rain storm earlier this week. I'm still fervently wishing for a white Christmas to come, despite it looking rather hopeless right now. 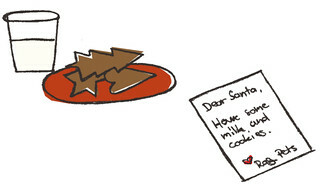 It's December, and the holiday season has begun in earnest. It's that time of year when the world falls in love, and every song you hear seems to say Merry Christmas! 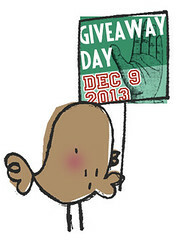 It's also time for Giveaway Day! Even though this is my 6th Giveaway Day already, I'm still just as excited and glad to be taking part as I was when I first took part in this week-long event of generosity, sharing, holiday spirit and wonderful crafts and crafters. I shan't ramble on longer about the delights of Giveaway Day (although I really could go on and on, and I do urge you to check out all the others taking part too! ), and just introduce my giveaway prize, Noë the little rag-cat, to you. I am giving Noë away to one lucky commenter who leaves a comment here, between now and Friday 13th (it certainly won't be an unlucky day for someone!) of December, telling me about what your fondest wish this holiday season is. Each and every commenter will be assigned a number, with the first person to comment being number 1 and the second commenter would be number 2 and so forth, and then come the 13th, I'll draw a random number to see who's the lucky person that Noë goes home to (I'm happy to ship internationally, so it doesn't matter where you're from). Noë is made out of linen and she's been stuffed with rags and polyfill. She has little button eyes, an embroidered nose and a linen coloured plastic button for a belly button. 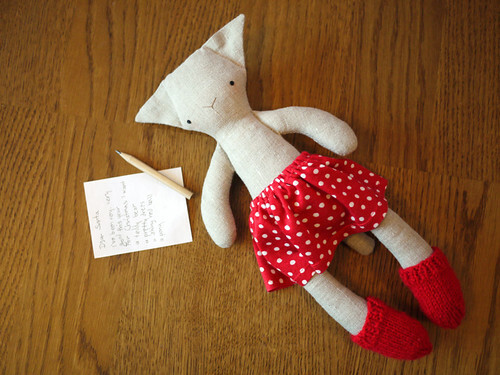 She's wearing a pretty red and white polka-dotted skirt made out of soft knit fabric and hand knitted jolly red woolly socks. Noë is all of 32 cm short, but every single one of those centimetres is kind and joyful. My most fondest wish this holiday season is that we'll get a white Christmas. So far we've only had a light dusting of snow fall, but I'm wishing with all I've got that more will come. It's just so very drab and dreary here without snow, and I think nothing much can make Christmas as magical as the world being a winter wonderland!